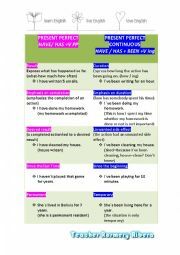 This is a comparative chart between PRESENT PERFECT Vs. PRESENT PERFECT CONTINUOUS. It has definitions and examples. This is a complete collection of modal verb meanings and examples. 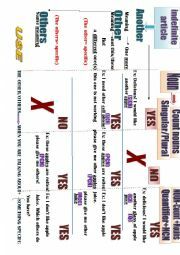 My students find this grammar guide very useful. Enjoy! This is a chart that I used with my students before they start practising. This way students are not able only write an answer, but also explain why they used either a gerund or an infinitive. You know...Do not give them a fish,teach them how to fish... I hope you like it!! This is a graphic representation of all the conditionals. It contains when to use then and what tenses to use to build each of the four types of conditionals. My students love it! 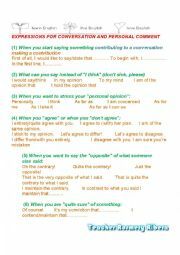 This is a compilation of phrases that students may use to broaden their conversation vocabulary. It is also very useful when you teach debate. This is an easy to follow grammar guide to teach Adjective Clauses. I hope you find it useful. Enjoy!! 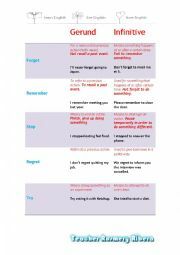 This is a simple way to show your students how and when to use OTHER OTHERS ANOTHER. Enjoy! 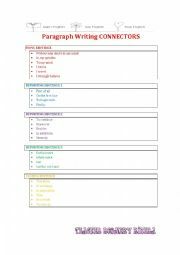 Here you will find the most common Argumentative Paragraph Writing CONNECTORS organized by topic sentence, supporting sentences and closing sentence. Enjoy!! This is a very simple way of teaching Comparatives paragraphs. Enjoy!! 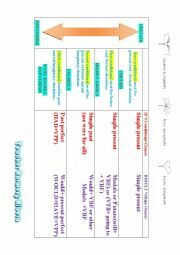 This is a complete presentation to teach WORD FORMATION. It includes the meaning of some prefixes. Enjoy! 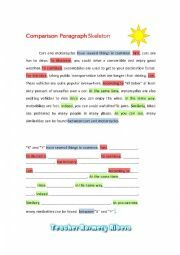 This is the first part, here you will find an animated PPP containing Types of adverbs and adverbs spelling rules. This is a very simple way to explain Modals of Speculation. It contains the grammar guide, examples and exercises. Enjoy!! Direct Speech AND Reported Speech ALL THAT CHANGES!! 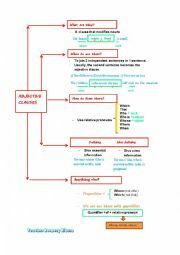 This is a very useful PowerPoint Presentation that reflects how I teach the basics of Direct Speech and Quoted Speech. It contains grammar explanations and several examples. I hope you find it useful! 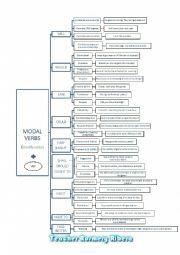 This is a complete explanation of the use and form of PERFECT MODALS OF SPECULATION. There are also slides to prompt your students to practice. I hope that you find it useful. This is a simple and easy to understand PPP to teach Argumentative Paragraph Writing. It tackles the concepts and uses of Connectors, Coherence, Cohesion, and Unity. It has two brainstorms and one complete paragraph. Enjoy!! This is a great lesson plan posted by an amazing Brazilian teacher on his website named http://wonderingaboutelt.blogspot.com/ I put the presentation together based on his post. Please download the videos there. The PPT was too big, so I had to cut it in 4 parts, sorry! Enjoy your class. Here is the second part of ALL ABOUT ADVERBS. 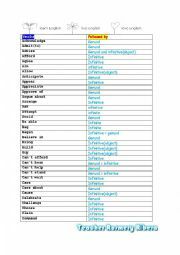 You will find IRREGULAR ADVERBS and ADJECTIVES THAT LOOK LIKE ADVERBS. I had to remove the animations and the design to make it weigh less than 2 GB!! You can make all the changes, please.